We dropped into Littondale by taking my favourite road over the moors from Settle - a chance to see the impressive limestone canyon of Yew Cogar Scar - one of the biggest masses of limestone in Britain. The Yew Cogar has to be seen to be believed - its terracing jutting into Littondale like the prow of a gigantic liner. It is one of the great sights of Yorkshire. A glance up the glaciated valley of Littondale - one of the most beautiful of the dales. Daughter Emily and friend Jed have done a few caves before ... but nothing quite like this one. Sleets Gill is a low arch leading to a bizarre slope giving one the impression of descending a giant rabbit burrow. This entrance once lay near the floor of the valley - but it has been left high and normally dry as glaciers have since lowered the valley floor. 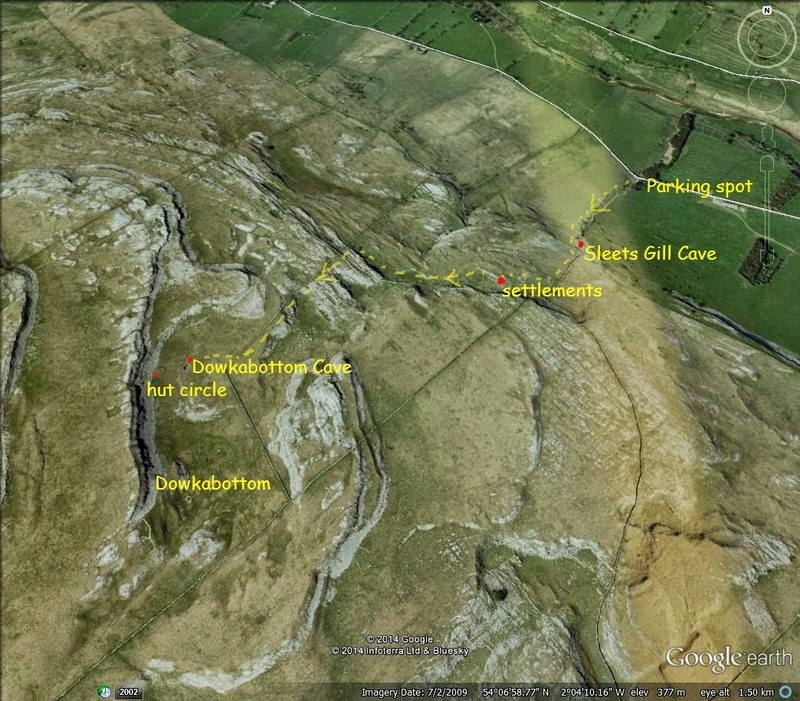 The infamy that surrounds Sleets Gill Cave is well deserved. 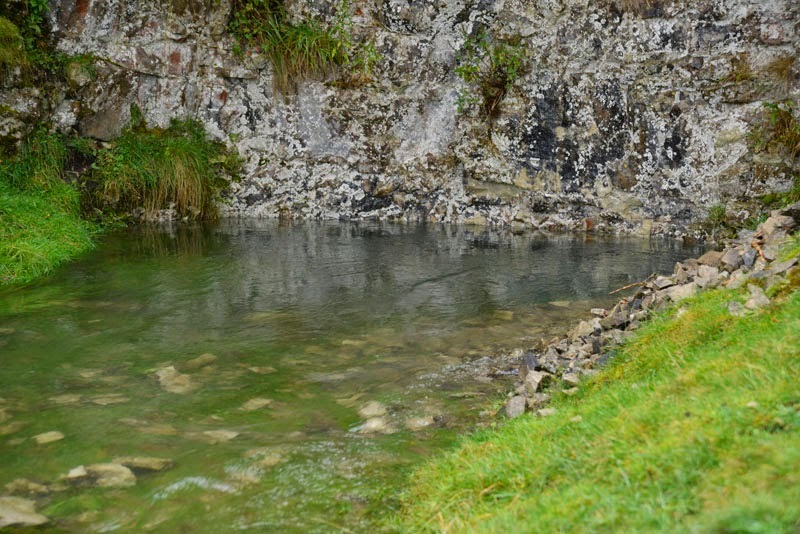 The passages below are sufficiently deep underground to lie very close to the water table - and it can take rainwater weeks to seep down through the surrounding limestone. Without warning - even on dry days and up to a week after rain ... the cave can suddenly flood to the roof. So bad is the flooding that water is forced out of this entrance and gushes down the normally dry limestone gill towards the valley below. Worse .... the first part of the cave to flood is the bottom of the entrance slope ... so anyone beyond it would be trapped in the passages beyond. This most famously happened to two cavers in 1992, when they had to be rescued and dived out by the cave rescue team (see my April post on Dowkabottom Cave for more details). Even for those who intend to go no further - a trip to the bottom of the entrance slope is a fantastic experience. There is no other cave entrance like this in Britain. Lying on your stomach - in clothes that don't matter - there is this fantastic view back up the steep 52 metre slope to daylight. Sleets Gill is just awesome. Most people would look at the crawl at the foot of the slope - shudder and retreat! However, if you spend a good 20 minutes kicking cobbles away and widening the crack ... you just lie on the scree and almost sledge on your back under the rock .. wondering where the hell its going to all end! Coming up - as you will see later ... is amusing indeed! Meanwhile - as you await your turn to descend into the bowels of the earth ... have a look round at the fine calcite walls. Why not? Once through the low section there's a chance to sit up in a small chamber. Jed is taking a breather - with Emily emerging through the crawl just behind him. Then there's yet another low crawl under the rock. Knowing the amazing sights that lie ahead, and having come this far - it would be daft to turn back! A series of low archways present themselves as we head in anticipation towards the Main Gallery. Just under here - and then we're in. There are huge mud banks everywhere that have been built up by flooding and they are very slippery underfoot. You have to take care here. The first sight of the Main Gallery is a humbling experience for a mere human. Your ears feel a strange kind of pressure and there is this feeling of being really deep underground. The world outside seems a mere dream. The scale of the place is enormous - and as you keep heading forwards it just gets more and more impressive. Emily negotiating the mud banks in the Main Gallery. The floor is often of calcite and gour pools - so 'Golden Gallery' would aptly describe its beauty. Stalactites are few as the cave still floods to the roof with regularity - but there are some fine flowstone formations along the walls of the gallery. The floor of the Main Gallery often consists of attractive calcite sculpture - as can be seen here. Jed posing in the Main Gallery, with a calcite pillow and the passage big enough to drive a train through. Attractive pillow - though I wouldn't like to fall asleep down here. The best known feature in the cave is this fabulous flowstone column in the far reaches of the Main Gallery. At the far end of the Main Gallery - a drop leads down to the notorious Hydrophobia Passage - a low tunnel containing a fast flowing stream where the caver literally has his face in the water. Beyond that is a massive underground ramp even larger than the entrance slope - but these require full caving gear and nerves of steel. After a couple of hours underground - we sensibly turned back - knowing the challenge of getting back up the entrance slope was enough to think about! Even though it hadn't rained for more than a week - and before that for a condiserable time - water was still flowing in a sinister way along the floor of the Main Gallery. In places the pools were knee deep. This is perhaps the classic image that pops into mind when most cavers think of Sleets Gill Cave: the wonderful railway tunnel-like profile of the Main Gallery - a phreatic tube in caving terms, formed completely under water. It is so difficult to photograph as the air is full of water droplets. A lot of image processing is needed !! Heading back through that same tunnel. it is a privilege to see it. Jed dwarfed by the scale of the passage and the mud banks of the Main Gallery, Sleets Gill Cave. Beginning the long crawl back up the entrance slope. The angle is steep and as you grab at the rocks they just move with you. It is a battle against gravity and the roof is only inches above your head. I was about fifty feet above Emily when her light first showed itself where she was crawling up behind me. Wish I could have tape recorded her voice!!! Yes - that yellow helmet is approaching slowly. Five minutes of struggle can perhaps get you ten feet higher!! Such is the challenge of the crawl out. Jed was somewhere behind ... but at this point Emily just rested ... unable to turn her head. Some idea of the severity of the crawl. I've known it a lot easier in the past - but the recent wet winter has played havoc with the cobbles. It was all too much for my poor daughter - and she curled up in a ball for five minutes of reflection! At last - they both emerged ... with just a fifty feet climb left back to daylight. And here's your truly .... heaven knows how he got himself through there. He'll suffer tomorrow! Sleets Gill Cave lies just east of Arncliffe. It should be explored only by confident cavers and with someone who knows the system. However, it is worth a visit just to saunter down the entrance slope in clothes that don't matter. Just treat this cave with the greatest respect. Great post and a superb cave. I really enjoyed it. But it gives me the creeps. I have been down twice - to the end of the crawls - but having witnessed water coming out of the entrance (not as a gentle stream but as a 2ft high pressure dome) I would never ever go down it again - even in a drought! Many thanks: to be honest I think my times down there are done! Looks great on camera with the Main Gallery - but you can never relax in it. Many caves I can get out a flask and sip in contentment - but I never hang about in Sleets Gill. As a cave, however, it is truly spectacular. :) Cheers and thanks for the comments. Stephen . Explored this cave in 1950 with a group of Scouts during a dry summer and found little water in the stream bed and had an enjoyable and safe time. Some time later, with my wife, we intended to get to at least the crawl, with no intention of my wife to tackle it! However, half-way down the scree slope, we encountered still, clear water, so no possibility of going any farther! Later events proved the danger of this great cave of which we were so unaware on our first visit! !